We’d love your help. 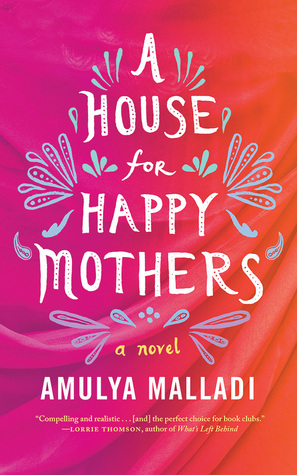 Let us know what’s wrong with this preview of A House for Happy Mothers by Amulya Malladi. In trendy Silicon Valley, Priya has everything she needs—a loving husband, a career, and a home—but the one thing she wants most is the child she’s unable to have. In a Southern Indian village, Asha doesn’t have much—raising two children in a tiny hut, she and her husband can barely A stunning new novel—full of wit and warmth—from the bestselling author of The Mango Season. To ask other readers questions about A House for Happy Mothers, please sign up. I just started to read it since I was a free kindle book. Interested. Not my topic of choice? 2.5 stars. I kept reading because while I have given some thought to the concept of surrogacy, I wasn't aware of the surrogacy market in India and the book kept me thinking, sometimes very uncomfortably. The thing is, the big takeaway I got from this book is that the type of surrogacy portrayed is completely, utterly, disgustingly exploitative. Not to mention heartbreaking. (Note that this is the message I took away from the book. I have not done extensive research into the surr 2.5 stars. I kept reading because while I have given some thought to the concept of surrogacy, I wasn't aware of the surrogacy market in India and the book kept me thinking, sometimes very uncomfortably. "Through their social circumstances, their different worlds - they had touched each other in an irrevocable way. Their bond, not something that would be renewed, could nevertheless be broken. [Um...so the client is going to disappear and never speak to the surrogate again, although it is entirely in her power to do so, but that's a bond that can never be broken? Huh?] Their names meant "hope," and they had given hope to each other, and this was what brought them together, closed the gap between them, eliminated the social and class differences, made them sisters, mothers - made them equals." Amulya Malladi, a bestselling Indian author, has penned a thoroughly refreshing and alluring contemporary fiction called, A House for Happy Mothers that surrounds around two women, one wants a baby desperately thus choosing the surrogate route to India away from her posh Silicon valley life with her darling husband and aristocrat friends, and the other is desperate to provide a good schooling and education to her highly intelligent son and also to keep the wolves away from the doorstep of her poor household by selling her womb. A journey that connects two mothers in different yet in emotionally similar ways that is vivid, raw and extremely heart-touching to read about. Priya, the Indian-American woman, has the perfect life that a woman can ever ask for, a perfect career, a perfect and doting husband, and a great home, and the only thing missing is a child of theirs own. Unfortunately Priya can't get pregnant, after several miscarriages and terrible nightmares, together, Priya and her husband decides to opt for surrogacy service, a borrowed womb to carry their future child. Hence they have to travel all the way to India, to her husband's hometown at Hyderabad to borrow the womb of another woman who is going to give Priya hope of becoming a mother. Asha, a mother of two and wife of a house-painter, can barely manage to keep her household financially stable, considering her husband's low-paid daily laboring job. And not to mention, she desperately needs money to admit her highly intelligent and gifted son to a proper school where he can excel and get all the guidance. Hence upon the suggestion of her sister, she decides to sell her womb for money by carrying a child of someone else. Two women, one becoming a mother to give her son a proper education and the other is desperate to become a mother to her own child. And when their paths collide through motherhood, it is beyond amazing and emotional to witness such moments between them. This is the first time that I read any book by this author, and even though I had no idea about her previous books or her writing style, this book simply won my heart. The world of surrogacy isn't that explored or talked about or penned about by the authors and the subject of surrogacy has always been a mystery to me, so the blurb of the book lured me to grab a copy of this book and start reading instantly. And glad I read this book, the author vividly showed me the truth and emotional struggle behind the expensive world of surrogacy. Penned with evocative feelings that is bound to move the readers deeply all through the tale, this book is an extremely poignant one. The writing style of the author is brilliant and eloquent, laced with deep emotions. The narrative is equally engaging and articulate and sways gently with its free flowing movement. The pacing is smooth as the story is crafted with enough unforeseeable moments that will keep the readers glued to the book. Also the issues addressed by the author, especially the journey of a woman, who is bearing a child which is not her flesh and blood, is very well portrayed by the author with raw emotions and sentiments that will make the readers sympathize with her ordeal. The author has done her research really well, as she has intricately depicted the reality behind the white washed walls covered with promising and glossy family pictures of any surrogate centers of the country. But the author's focus primarily remained on the lives of the two women, where one is pregnant and the other is eagerly and happily looking after the other one's family. And surrogacy can bring two families with no blood ties closer than one can ever imagine and that is wonderfully captured by the author into this book. The characters are really well developed by the author, as they depict realism, honesty and emotions that are highly relatable to the eyes of the readers. Priya is a complex woman, but why wouldn't she be, considering the challenges she has faced in life and also she has many layers to her personality. Asha is a simple housewife, a mother and a wife with only one dream to give proper education to her son and her determination is the driving point of this story, as she goes through an emotional upheaval, yet holds tight to her promise of delivering and giving away the child she is carrying in her womb. The secondary characters are also very interestingly penned, especially the husbands of both the women. In a nutshell, this is a must read book about motherhood and compassion, for all contemporary fiction readers. Verdict: Poignant and captivating to its very core. In America, one SF Bay area family, Madhu and Priya, husband and wife, childless, multiple miscarriages, hearts broken, breaking over their multiple losses. Madhu was born in India, Priya’s mother is Indian, her father “American.” Priya can’t imagine a life without a child, so she investigates what options there are left to her. In India, one family, Pratap and Asha, husband and wife, their two children, Manoj and Mohini, son and daughter. Born into poverty, and knowing that their son Manoj is v In America, one SF Bay area family, Madhu and Priya, husband and wife, childless, multiple miscarriages, hearts broken, breaking over their multiple losses. Madhu was born in India, Priya’s mother is Indian, her father “American.” Priya can’t imagine a life without a child, so she investigates what options there are left to her. In India, one family, Pratap and Asha, husband and wife, their two children, Manoj and Mohini, son and daughter. Born into poverty, and knowing that their son Manoj is very advanced for his very young age, Asha feels the need to find a better education for her son. A better education means money, which they don’t have. Pratap’s sister-in-law found an “easy” way to make money, becoming a surrogate for a “rich” American couple, and now he thinks his wife should do the same thing for their family. No one’s motives are completely pure in this story, this isn’t a “happy” story in any real or traditional sense. While there is some degree of happiness, perhaps, for some of those involved, it ends up somewhat tainted all the way around. Many thanks to Lake Union Publications, NetGalley and to author Amulya Malladi for providing me with an advanced copy for reading and review. There are so many underlying themes in this book from the desire to have a baby, family dynamics, the economics of the poor, the ethics of surrogacy and privilege. The heart of the story belongs to Priya who desperately wants a baby. She has been trying and trying; she’s suffered several miscarriages and failed IVF treatments. She is OVERWHELMED with wanting to have a baby. Her husband supports her but he’d be fine with or without and it’s leading to strains in their marriage. Priya learns of a There are so many underlying themes in this book from the desire to have a baby, family dynamics, the economics of the poor, the ethics of surrogacy and privilege. The heart of the story belongs to Priya who desperately wants a baby. She has been trying and trying; she’s suffered several miscarriages and failed IVF treatments. She is OVERWHELMED with wanting to have a baby. Her husband supports her but he’d be fine with or without and it’s leading to strains in their marriage. Priya learns of a program where underprivileged women in India will act as surrogates and she sees this as the answer to her prayers. Others around her aren’t so sure. Asha is a poor woman in India with two children. Her son is academically advanced and he is completely bored in his current school but she and her husband cannot afford to send him to a better school. Her husband wants out of the tiny village where they live and into the city. He encourages her to become a surrogate for the money – to him it’s no big deal. Then they can buy a flat and he can find a better job. He gives absolutely NO consideration to the emotional toll it will take on her. He also does not think spending the money on their son’s education should be a priority. He is more concerned with his ego. The House for Happy Mothers is where Priya’s world and Asha’s worlds come together and each woman learns that what they thought about the other’s life is not necessarily true. Nor is the house full of happy mothers. This was a very interesting book for so many reasons. It is so far off of my radar for reading genre and in regards to my life in general but something about it intrigued me. I’m glad I took the chance on it. It’s not perfect, I think it could have goon even deeper into some of the issues – but perhaps the author chose not to intentionally. It could be she wanted to leave the book on the lighter side. Is it ok for a rich woman to pay a poor woman to carry her child? Is it exploitation or is it helping that woman climb out of poverty? In a patriarchal society is the woman really making the decision or is she being pressured into it by a husband? Lots of very interesting questions arise. What is interesting about this book is the moral questions that arise about surrogacy. In this story, Priya and her husband Madha, who live in America, tried to have a child the natural way three times, but each time ended in miscarriage. While adoption is an option, Priya has a friend who went through a service that uses impoverished woman in India to act as a surrogates, so Priya convinces her husband (who would be just fine with not having a child at all) to go the surrogacy route. The book sh What is interesting about this book is the moral questions that arise about surrogacy. In this story, Priya and her husband Madha, who live in America, tried to have a child the natural way three times, but each time ended in miscarriage. While adoption is an option, Priya has a friend who went through a service that uses impoverished woman in India to act as a surrogates, so Priya convinces her husband (who would be just fine with not having a child at all) to go the surrogacy route. The book shifts from Priya’s point of view to the surrogate mother’s point of view. Asha already has two children when she becomes a surrogate for Priya and Madha. She and her husband need money for their exceptionally smart son to go to a good school and for a dowry to “marry off” their daughter. Also, it would be nice for them to own their own home. When Asha bleeds part way through the pregnancy, she has to leave her family to live with the other surrogate mothers under strict medical scrutiny. At the surrogacy house, the women get fancy things like toilets that have seats and fruit they otherwise could not afford. Even so, Asha does not like have her body being farmed out, but she was taught not to argue with her husband, so for the most part, she just does her best to voice her opinion that the money should be spent to improve the lives of their children and not on frivolous things. While it’s intriguing to learn about very different lives and the ethical concerns of surrogacy, the story gets very repetitive: Priya and Madha endlessly have conversations about whether they are doing something good—helping Asha and her family financially—or if what they are doing is morally wrong. Also, they’re constantly having conversations about whether something bad might happen to their baby before it’s born plus all the other worries first-time parents have. I became emotionally invested in both women’s stories, but the repetition made this book only so-so in my opinion. This story deals with the issue of surrogacy. The problems faced by surrogate mothers and the donor mothers ..and their spouses and close family. The discrepancy between rich and poor lives.. This was an emotional rollercoaster ride lasting 9 months with occasional flashbacks into their lives. Was an interesting topic, compasisonately told. I could totally relate to the story as it is against an Indian backdrop and the idiosyncrasies that come with Indians back in India as well as those living in the US. I can imagine myself becoming baby-crazy like Priya if and when comes the time. "Priya had always believed happy couples agreed on everything, but now she realized that healthy couples learned to respect even when they disagreed. It wasn’t how much you fought; it was about how good you were at making up. It was about trusting each other and the relationship to have that fight, to get it out there and have the love to heal the wound, temper the argument, and laugh about it." I really loved the relationship between Priya and Madhu. It's not black and white, its not perfect as neither are marriages/relationships perfect. But they support each other, go through the journey of becoming pregnant together. What i loved the most is they understood the drama that comes along with being married, relatives and having indian parents! "I learned many things these past months. And one very important thing I learned is that you and I, we’re family. Complete. Our child . . . makes our family bigger, changes the dynamic, but doesn’t change the core of it." The concept is intriguing: an Indian couple in America cannot have children, so they turn to a surrogate in India. The book follows their different backgrounds and motivations. This book could have been a great exploration of the surrogacy market in India, the emotional toll it takes on both families, cultural differences, etc. Instead it is a collection of trite conversations and terrible parties where people keep judging each other and talk about materialistic things. I always hated those part The concept is intriguing: an Indian couple in America cannot have children, so they turn to a surrogate in India. The book follows their different backgrounds and motivations. This book could have been a great exploration of the surrogacy market in India, the emotional toll it takes on both families, cultural differences, etc. Instead it is a collection of trite conversations and terrible parties where people keep judging each other and talk about materialistic things. I always hated those parties. Priya and Madhu are a well-to-do, Indian-American couple from Silicon Valley. Though they lack for nothing, they struggle to have a baby. After several miscarriages, Priya opts for a surrogate mother. In a small village of India, Asha and Pratap and their two children live in a hut. When neccesssity arises, Asha decides to become a surrogate but not without reservations. Thus, when Asha is chosen as Priyas surrogate, both women embark on a difficult and emotinal journey. Having previously read a Priya and Madhu are a well-to-do, Indian-American couple from Silicon Valley. Though they lack for nothing, they struggle to have a baby. After several miscarriages, Priya opts for a surrogate mother. In a small village of India, Asha and Pratap and their two children live in a hut. When neccesssity arises, Asha decides to become a surrogate but not without reservations. Thus, when Asha is chosen as Priya´s surrogate, both women embark on a difficult and emotinal journey. I've watched quite a few documentaries on the subject and it's heart breaking, even if it can be a win-win situation for both the couples that can't have children, and for the mothers, who can improve their normal lives due to the money they get as surrogates. And I say it "can" be, as how can we know if we're not in that s The surrogacy market is thriving in India, or at least was before the government started talking about shutting it down as they deemed it was an exploitation of Indian women. This is a well written book, but I felt it lacked depth. It's more a description of what happens than the feelings that go with it. And, here appears my feminist side, there's the situation of Manoj, who seems to be a brilliant boy, and sending him to school, but never of finding out if the little girl is as intelligent as her brother (she seems to be very young) and sending her to school too. I chose this book very randomly from the Kindle Unlimited selections. I had just finished a very long novel and was looking for a quick and easy ready and for familiarity. When the story started out with an Indian couple in the tech world in Silicon Valley, I felt almost at home (I used to travel to San Jose all the time and worked at a tech giant and have a lot of Indian friends!) I think it is a very well-written story that flows and reads very quickly. I finished this book on the bus rides an I chose this book very randomly from the Kindle Unlimited selections. I had just finished a very long novel and was looking for a quick and easy ready and for familiarity. When the story started out with an Indian couple in the tech world in Silicon Valley, I felt almost at home (I used to travel to San Jose all the time and worked at a tech giant and have a lot of Indian friends!) I think it is a very well-written story that flows and reads very quickly. I finished this book on the bus rides and flights today so a one-day read. And I feel I know a lot more about surrogate mothers and the complexities of such a choice. The couple who is unable to have children, Priya and Madhu, are likable enough, but the bickering between them got a little annoying. I have to give it to the author though - it was real and raw and uncensored. It was like watching a Reality TV (not that I ever do, those things are such a waste of time!) but it was as if you were witnessing real life and that made it both uninteresting and familiar. Truth be told, it made me reflect on the ways I would use and abuse my powers as a spouse to get the upper hand or to pick on small little nothings. When emotions are not running high, it is so easy to look at an argument from the outside and side with the logical, sensible, calm person, but when we are in those situations, when we are feeling the anxiety and stress first hand, emotion kicks logic out of the window. It was good to see how foolish we can be by observing these bickerings from the outside. But back to the main story: Priya and Madhu hire a woman in India to act as their surrogate mother. The author then takes you to India and does it very well too. She gives us the view of a poor woman going through this choice of being a surrogate in order to give her son a better education and to help her family be able to afford a flat and a life of their own. And then the dynamics of "the parents" with the surrogate mother come in as the pregnancy progresses. There are instances of fancy parties of the rich and well-to-do of the Silicon Valley Indian community and as Priya interacts with them, she finds herself ashamed and guilty of doing the surrogate mother choice and unsure of what she wants - give up her career? stay at home with her child? Etc etc. I think I find her uncertainty and insecurity as the least attractive trait and for that, I wasn't able to bond with Priya as much as I had hoped. By the same token, I wasn't able to bond with Asha - the surrogate mother - perhaps for her helplessness, her constant state of wanting to express herself but not being able to do it - and all that stemming naturally from lack of education and lack of confidence, but I couldn't have enough sympathy for her. And I know I have had sympathy for characters in far far worse situations of life, so perhaps it was the insufficient character development and lack of intrigue. This is a short contemporary story about a couple who are unable to have a child of their own and their struggle of creating that child by going through extreme lengths. It brings up great questions such as why must you have children, and why is it such a defining part of being a woman (I don't believe that it is but anyway!). The best part about reading diversely, is that occasionally I come across books that teach me something new about things I think I know. I knew about the surrogacy market in India, or so I thought, until I read Amulya Malladi’s A House For Happy Mothers. Priyasha (Priya; ethnically half-Indian, but culturally fully American) and Madhu are a Silicon Valley couple who have been trying unsuccessfully to start a family. When Priya hears from some friends about surrogacy as an option, she convinces Madhu that they must try it. The surrogate who carries their baby is Asha, an uneducated housewife from a small village in Andhra Pradesh, India. A House For Happy Mothers tells the stories of both these women who will go to great lengths for their child–Priya, for the baby she craves and Asha for the gifted child she wants to ensure an education for. I have to mention at this point that parts of this book may be triggering for women who are struggling to start a family, or have had miscarriages. Going beyond the surrogacy, the novel also explores other themes like poverty, mother-daughter relationship, and the relationships between these women and their husbands. Personally, I enjoyed exploring the contrast between the city bred, progressive Madhu, versus Pratap, Asha’s husband, who is still caught up in the patriarchal mindset which allows him to make the decisions for his wife.Seeing how this experience affects both these marriages was thought-provoking. Malladi’s observations on Indian societal expectations are spot on and I could relate to them completely. In simple prose, free of embellishments, these characters and their stories become three-dimensional. Malladi doesn’t take sides or become judgmental. Alternating between Priya’s and Asha’s POV she offers glimpses of both these worlds, generating empathy for both. A House For Happy Mothers asks all the ethical and moral questions, but offers answers to none. It only shows us these two worlds and leaves the decisions to the reader, because ultimately happiness is never what we think it is. FTC disclaimer: I received an ARC of this book from the publisher via Netgalley in exchange for this honest review. Thank you Netgalley for the opportunity to read this ! 3.75 stars. It's a basic story of two couples one couple who can't have children and another couple that can. We have Priya and Madhu in America who are Indian but live in California. Priya has suffered a few miscarriages and turns out she won't be able to carry her baby to term so they go through a surrogacy outfit in India and another woman Asha becomes a surrogate. The story is about what it's like to have to do things because you want a Thank you Netgalley for the opportunity to read this ! 3.75 stars. It's a basic story of two couples one couple who can't have children and another couple that can. We have Priya and Madhu in America who are Indian but live in California. Priya has suffered a few miscarriages and turns out she won't be able to carry her baby to term so they go through a surrogacy outfit in India and another woman Asha becomes a surrogate. The story is about what it's like to have to do things because you want a better life for your family and Asha has 2 children and one of them is 'mensa' smart and she wants hi to go to a better school. But her husband wants to buy a flat. They only get a certain amount of money. We get to see the intricacies of a marriage where the man usually has the last word. We also witness Priya and how she loses her job and how she is so determined to have a baby that she puts her husband second. But the bulk of the story is about what it's like to have a baby for someone else. Do you get attached? do you have negative thoughts about the rich mother who can afford to do this. Do you fantasize about running away with the baby that you have grown to feel as your own. I'm picky, and seldom give a five star review, unless it's meaningful. And I can't waste anymore time reading this book. There is too much detail...he said, she said, he felt, I felt....which, for me, diluted anything worth telling. It's another book with a good story line, but it NEVER delivered. First of all, I take umbrage with the crude words and expressions which the author casually sprinkles through-out the conversations of her main characters. This language is not what I've heard, nor expe I'm picky, and seldom give a five star review, unless it's meaningful. And I can't waste anymore time reading this book. There is too much detail...he said, she said, he felt, I felt....which, for me, diluted anything worth telling. It's another book with a good story line, but it NEVER delivered. First of all, I take umbrage with the crude words and expressions which the author casually sprinkles through-out the conversations of her main characters. This language is not what I've heard, nor expect, from the gentle, kindly, Indian people I've known...coming across as crass, and not the kind of people I can relate to, or want to know. Complain...complain...complain....me...me...me. Blah...blah...blah... gossipy, self-centered, judgemental and oblivious to the feelings of others. I simply didn't like Priya, her husband, or her friends. No, it did not show the emotional bonding of two women, but instead depicted Priya, and her friends, as shallow, self-involved, ugly Americans, who took advantage of the surrogate's naiveté, lack of education, and poverty. I stayed with "A House for Happy Mothers" until I found myself falling asleep while reading. If you had the opportunity to give another woman a precious gift of life, would you? This story tells the role of each woman; their issues, financial status, their family and so forth. The major difference is one woman can't have children and the other can. The surrogate mother lives in India and needs the money to find a place to lve and better schooling for her son. Each woman deals with the hardship of pregnancy from different perspectives. Priya keeps having miscarriages but wants a baby so If you had the opportunity to give another woman a precious gift of life, would you? This story tells the role of each woman; their issues, financial status, their family and so forth. The major difference is one woman can't have children and the other can. The surrogate mother lives in India and needs the money to find a place to lve and better schooling for her son. Each woman deals with the hardship of pregnancy from different perspectives. Priya keeps having miscarriages but wants a baby so bad, she's willing to put it before her marriage. Asha doesn't want to be a surrogate but due to their financial situation, she does it to survive. 4.0 out of 5 stars -- If you were really desperate for a baby, what would you do to get one? Is there really hope after a series of miscarriages and barrenness? That question is at the heart of this contemporary fiction novel that begs for debate and discussion. In this case, a surrogate is hired in India to carry the baby that a US couple, Priya and Madhu want so badly. In the awkwardness of the encounters between the surrogate and the natural parents are the twins angst and doubt. Who is using 4.0 out of 5 stars -- If you were really desperate for a baby, what would you do to get one? Is there really hope after a series of miscarriages and barrenness? That question is at the heart of this contemporary fiction novel that begs for debate and discussion. In this case, a surrogate is hired in India to carry the baby that a US couple, Priya and Madhu want so badly. In the awkwardness of the encounters between the surrogate and the natural parents are the twins angst and doubt. Who is using whom? For Asha and Pratap, the opportunity to grow this baby will provide much needed money to give their brilliant son a chance to attend a good school or for the family to buy a real home. For the donor couple, a bit embarrassed by the whole ordeal of secret surrogacy, the use of a host mother gives them the baby that Priya feels she NEEDS in order to create a family. Is this a moral dilemma? And if you don't have children, are you really a "family?" Segregated away in India at a special clinic in the House for Happy Mothers, Asha waits anxiously for the delivery of this child. She is in the company of other women who are doing the same thing as she -- and those women display a variety of emotions and rationalizations. Asha feels the baby move inside her and questions her own motives. Will she be able to give this infant up after carrying it for 9 months? Her husband, son, and daughter visit her faithfully but they don't understand the sacrifice involved here. Asha is no longer in control of her own body. These two couples undergo extreme examination of conscience. As they attempt to explain to others their reasons for choosing this route, both women especially have to look deep inside to analyze their motives to explain their choices. Families are divided, the verdict is in question--was this the right way to do it? Is it OK to use the baby farm? Are there winners and losers? As always, this author creates characters that could be you or me. She puts us in the position of having to evaluate our own set of beliefs and values. There is no right or wrong here, or is there? Personally I can't imagine hiring a surrogate, but then again, I was never desperate enough to have a child to have to think about this option. I do know women who would do this in a heartbeat. I don't allow myself to pass sentence. It was quite interesting to see the different points of view of these two women characters and how they handled this situation. Their families were both supportive and judgmental -- but isn't that like real life?? My only complaint about the book was the overly sentimental happy ending for everyone -- but hey, isn't that what we all wish for? At times very sad, but with a touch of humor, Amulya Malladi gets it -- life is really complicated! The inner thoughts of women are complex! Ich habe bislang noch kein Buch zum Thema Leihmutterschaft gelesen und war von daher sehr gespannt, wie die Autorin mit der Thematik umgegangen ist und wie sie umgesetzt wurde. Da das Thema Leihmutterschaft in vielen Ländern nach wie vor ein Tabuthema ist, habe ich hier zunächst befürchtet, dass die Autorin die Geschichte zu sehr mit erhobenen Zeigefinger schreiben würde, allerdings war dies hier nicht der Fall. Das Thema wird gut erzählt, man lernt unterschiedliche und interessante Figuren kenne Ich habe bislang noch kein Buch zum Thema Leihmutterschaft gelesen und war von daher sehr gespannt, wie die Autorin mit der Thematik umgegangen ist und wie sie umgesetzt wurde. Da das Thema Leihmutterschaft in vielen Ländern nach wie vor ein Tabuthema ist, habe ich hier zunächst befürchtet, dass die Autorin die Geschichte zu sehr mit erhobenen Zeigefinger schreiben würde, allerdings war dies hier nicht der Fall. Das Thema wird gut erzählt, man lernt unterschiedliche und interessante Figuren kennen und besonders die Gefühle, speziell die Ängste der Figuren, werden sehr gut beschrieben. Dadurch, dass die Geschichte abwechselnd aus der Sicht von Priya und Asha beschrieben wird, erhält man gleichzeitig einen guten Einblick in ihre Gefühlswelt, sodass ich mich zumindest teilweise in die Figuren hineinversetzen konnte. Am Schreibstil ist lediglich zu kritisieren, dass dieser manchmal zu langatmig ist und sich an Kleinigkeiten aufgehalten wird, die für die Geschichte nicht zwingend wichtig sind. Erzählt wird hier die Geschichte zweier Frauen, die unterschiedlicher nicht sein können. Während Priya nahezu alles besitzt, eine gute Beziehung führt und erfolgreich im Job ist, lebt Asha in Indien unter ärmlichsten Verhältnissen mit ihrer Familie in einem kleinen Dorf, wo sie täglich ums Überleben kämpfen müssen. Während Asha bereits zwei Kinder hat und für sie nur das Beste, sprich eine gute Ausbildung möchte, hat Priya damit zu kämpfen, dass ihr der größte Wunsch verwehrt bleibt, denn sie selbst kann keine Kinder bekommen. Das Cover ist traumhaft schön und hat mich direkt angesprochen, sodass ich direkt einen näheren Blick auf das Buch werfen wollte. Auch die Kurzbeschreibung weiß durchaus zu überzeugen. Ich finde zwar, dass diese bereits zu viel verrät, allerdings hat diese insgesamt mein Interesse geweckt. Perhaps it was the heading on the product page describing this book as ‘full of wit and warmth’ that led me to believe that it would be an uplifting choice. Unfortunately, I found it to be such a sad story with no offsetting levity. Surrogacy is such an emotional issue for both the parents as well as the surrogate mother and the setting amidst the poverty of India makes it even more heartrending. On the plus side, it was interesting to learn more about the Indian culture at the various levels and Perhaps it was the heading on the product page describing this book as ‘full of wit and warmth’ that led me to believe that it would be an uplifting choice. On the plus side, it was interesting to learn more about the Indian culture at the various levels and this detail was well presented. However, there was so much repetition in both dialogue and narrative when it came to describing the feeling of the characters about the process itself as well as the impact on their marriages and families. It may be that the author just wanted to drive home the conflicting sentiments but the sad redundancies were a definite negative for me. Readers who loved "A Breath of Fresh Air" will find this a significantly different read. It reads much lighter than "Breath" and does not feel formulaic in topic or writing style. An American-Indian woman is infertile; an Indian woman is trying to build a future for her children. Each gives what they can in order to achieve their goals. Priya and her husband pay Asha to be their surrogate, and Asha plans to use the payment to pursue her son's education. Ethical questions arise as we see the sacr Readers who loved "A Breath of Fresh Air" will find this a significantly different read. It reads much lighter than "Breath" and does not feel formulaic in topic or writing style. What a great story! I felt it really showed the cultural issues of both women very well. I got this book as an Amazon First read and very glad to pick this book. Nice book to read on Mother's Day! Happy Mothers is the name of a surrogate clinic in India (It is not really so happy for the surrogates)! Would recommend this story! Amulya Malladi’s novel, A HOUSE FOR HAPPY MOTHERS takes us on an emotional journey of surrogacy, experiencing the heart-wrenching terrain encountered by mothers in first and third worlds. The culturally different roles women play in these societies are highlighted in what used to be warm, private family experiences, that some might argue now have become “rent-a-womb” business transactions. Priya is the daughter of a Caucasian father and an Indian mother. She lives in Silicon Valley and has everything she could want, a wonderful husband, house, career, but she’s unable to have a baby. Asha lives in a small tin roof hut in an Indian Village, half-way around the world with her husband and two children. They struggle to eat and keep a roof over their heads, but Asha is desperate to afford an education for her gifted son. Asha knows of the Happy Mothers House, essentially a “baby farm” for wealthy childless couples overseas. It’s not her first choice to make money, but after her family pressures her, she checks in. Priya’s friends and family are surprised she is willing to tap into India’s rising surrogacy industry, wondering if she’s exploiting Asha. A HOUSE FOR HAPPY MOTHERS is a thought-provoking novel that will work well in book-clubs. The story alternates between Priya and Asha perspectives, from Silicon Valley back to the small Indian Village. Priya frequents late night internet surrogate message boards. Asha is part of a traditionally arranged marriage, and must obey her husband, also worrying if her husband will squander the money they make. “Womb-renting” is frowned upon in the Village, so many women hide, emerging nine-months later saying they “lost” the baby. Amulya uses subtle nuances to bridge the two women’s stories over two continents and cultures without making any judgements and leaves readers are to decide for themselves. Yet another 3.5 stars if I could. Thought provoking, but too neatly wrapped up. Author spends a lot of time telling how everyone feels but not a lot on showing it. TONS of background info dumping at the start, and then randomly interrupting the story later on (like she'll mention - as a totally made up example - "the time we had that cat that we loved, and then it ran away, and now every time I see cats I'm sad." And then flash back to now detail the story of the cat and its outcome that was alr Yet another 3.5 stars if I could. Thought provoking, but too neatly wrapped up. Author spends a lot of time telling how everyone feels but not a lot on showing it. TONS of background info dumping at the start, and then randomly interrupting the story later on (like she'll mention - as a totally made up example - "the time we had that cat that we loved, and then it ran away, and now every time I see cats I'm sad." And then flash back to now detail the story of the cat and its outcome that was already laid out nicely in that one sentence of conversation). I have personal experience with surrogacy (I attempted to be a surrogate, but was unsuccessful at getting pregnant after multiple tries) and met in person and online lots of intended parents via surrogacy and surrogates, and though my experiences were all of surrogacy in America, there were some universal things that I felt the author definitely got right. I also think there are some that were unique to the situation of having a language and cultural divide that were nicely explored here. There was also some examination over motherhood choices, but not as many or as deeply explored as I would have expected. I found the ending of the novel was too abrupt, and if there ever were a case where I'd want an afterword relating the characters' lives a year or two down the road, this was it. A House for Happy Mothers showcased the hope, love and lengths mothers will go to for the sake of their children. Both Priya's and Asha's stories are compelling, but what makes A House for Happy Mothers is the ethical and social perspectives that are brought to our attention in surrogacy and exploitation of the poor. I think this would be a particularly interesting discussion for a mom's book club. For my full review and a free printable of book club discussion questions, see my blog at Mom's Sm A House for Happy Mothers showcased the hope, love and lengths mothers will go to for the sake of their children. Both Priya's and Asha's stories are compelling, but what makes A House for Happy Mothers is the ethical and social perspectives that are brought to our attention in surrogacy and exploitation of the poor. I think this would be a particularly interesting discussion for a mom's book club. I can highly recommend this book. It is a realistic look into the mind of surrogate mothers and the people that are compelled to use their services. I could hardly put it down as there was no way if predicting how the story would end. Wonderful character development and being set in India one understands a little more if what propels people to decide to allow someone else's baby to grow in their womb. This was fascinating and heart-felt. At times the writing felt rushed like the author wanted to get to the next big conflict and couldn't wait. However, it's solid and really opened my eyes to surrogacy. Obviously, this isn't the end all be all, but I never read anything about just that it's a way for a family to have a child. It was interesting to see the conflict on both sides. 3.5 bumped up to 4. Amulya is the bestselling author of seven novels, including her latest The Copenhagen Affair, which will be published in September 2017. Her books have been translated into several languages, including Dutch, German, Spanish, Danish, Romanian, Serbian, and Tamil. She has a bachelor’s degree in engineering and a master’s degree in journalism. When she’s not writing, Amulya works as a marketing exec Amulya is the bestselling author of seven novels, including her latest The Copenhagen Affair, which will be published in September 2017. Her books have been translated into several languages, including Dutch, German, Spanish, Danish, Romanian, Serbian, and Tamil. She has a bachelor’s degree in engineering and a master’s degree in journalism. When she’s not writing, Amulya works as a marketing executive for a global medical device company. After living in Denmark for 14 years, Amulya moved to California in 2016 and lives in Orange County with her husband and two sons.